Need Help With Your Miniature Schnauzer Puppy Sleeping At Night? Need help with your Miniature Schnauzer puppy sleeping at night, but holding onto hope that disruptive sleep will soon be a thing of the past? Well, if you are struggling to get your Miniature Schnauzer puppy sleeping at night in his own bed your predicament is certainly not an uncommon one. In our excitement and anticipation of the day when a newly adopted puppy is ready to come home we can overlook the fact that this bundle of fun is very likely to give us some sleepless nights; something that we actually hadn’t given much thought to. After all, it’s been quite some time since we had a new-born in our family and one’s memory of those sleepless nights fades quickly. It is intriguing how short a memory we humans have! So, your puppy has been home for a few days now and you and the whole family are struggling with running on a low battery due to loss of sleep. Puppy is perfect throughout the day time; eats his meals well; obliges with lots of play; takes naps without a second thought; comes night time and the whole world seems to turn upside down. It is time for you to seek some real help. We must remember that until the day you brought puppy into your home all he had known about sleeping was cuddling up alongside his mother and siblings and being in a wonderfully comfortable and secure world where life was a breeze, and sweet dreams abundant. Now he is on his own at night and having to deal with a huge feeling of loneliness. How Will You Cope With Those Sleepless Nights With Your New Puppy? With puppy no longer having his mother and and siblings for company, it is important for you to be strong and deal with this situation. Whatever you do, I advise you not to be like I was with my very first puppy. Believing that I understood his dilemma and feeling sorry for him I got up through the night and let him come into my bed. After all, it’ll be only a few nights and then he will sleep on his own. How wrong could I be! That little dog slept on my bed for all of his life and this caused me grief over many years as it was impossible to go away without him unless I could find someone to care for him who would let him sleep on their bed. If I’d had the sense to deal with that sleepless first night when he was a new puppy, his life and mine would have been easier. In spite of that I loved him dearly, but I certainly discourage anyone to do what I did. I realized too, in hindsight, that if I were to be truly honest my feelings at the time were probably not only for the unhappiness of my puppy but also because I wanted to get some sleep. So now, speaking from experience, I can say that unless you can dedicate the next 12 to 15 years of having your dog sleep in your bed every night, you must be strong and deal with this phase; and that’s what it is, simply a phase that will pass so long as you deal with it now in the correct manner. Decide on a particular sleeping area for your puppy. Ensure that the area you have chosen is warm and draught free. Be sure that this is where you want puppy’s sleeping place to be as changing the area in the first few weeks will cause him confusion. Let him ‘own’ this area. 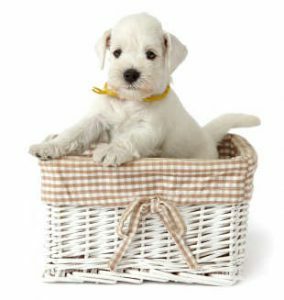 Provide your puppy with an appropriate bed, either a basket or fabric dog bed suitable for his size. Place a rug or familiar item in his bed. It is a good idea to provide puppy with a soft rug, or a garment such as an old T-shirt, to nap on through the day. This item then becomes a familiar part of his life and having it when he goes to bed at night will help your puppy feel comforted. It is wise to keep this item only for sleep time be it day or night, and hide it from him at play times; that way he will relate it to sleeping only. The use of a crate or cage for your puppy can be beneficial. Place his bed in the crate and this contained area will give him a sense of security that should help him to sleep. It is important to leave the door of the crate or cage open so that he doesn’t feel trapped. Make sure your puppy has his evening meal at a set time. Play with him in the evening before bed time and this will make him tired. Give him a snack meal before bed so that he is not hungry through the night. Do not give him a drink with this snack. Immediately after the snack, take puppy to his toilet area and wait until he has urinated. Praise him immediately after this action but don’t play with him at all. Now is the time to put puppy to bed. You can expect to be woken through the night as your puppy will want to urinate. Go through the same procedure as the early evening and put him straight back in his bed without any fuss except praising him for his good behavior. First thing in the morning, upon wakening, take puppy to his toilet area; you are both then ready to enjoy your day. Puppy will soon be sleeping through the night and you will have the benefit of enjoying a well behaved Miniature Schnauzer for many years to come. How old was your puppy when he slept through the night? Midas is 6.5 months and wakes me once during the night. The puppy I was referring to in the article only slept through the night because I allowed him to be on my bed. It wasn’t of choice. That was the only way I could get him to sleep. He was 3 months old when I bought him and he had been sleeping on a bed at night. Had I not let him sleep on the bed, I don’t know how long it would have been before he slept through the night. I had other puppies that slept though the night, although I can’t be certain of their exact age when that happened. I think the waking in the night becomes a habit which is hard to break. I would expect Midas to start sleeping all night in the very near future. Unless his waking is for toilet reasons, it might pay to try ignoring the fact he is awake. When he realizes that he won’t get your attention he should go back to sleep. Our miniature Schnauzer was nine weeks old when he came home with us. After three nights of him “singing” in the kitchen we decided to invest in a crate for night time only. This we installed in our bedroom and partially covered it with a blanket and added teddy bear. He can still see us. The first night in the crate wasn’t too bad and a great improvement on the previous three nights. He “sang” for 45 minutes. I sat on the edge of our bed in the dark, where he could see me but didn’t speak to him. Eventually he laid down and slept all night. We are now on night seven and all is quiet, he went into the crate, we said “bed time Beau,night night” and within five minutes he was sound asleep. During the day he happily climbs into his normal bed downstairs when he’s tired out. Next job? Stop the skin piercing biting !! Time out called for I think. That’s so lovely to read, Christine. Thank you. It’s always great to read about the joy and pleasure that a puppy adds to one’s life. So often I read about problems that appear to be caused by the dog, and not the owner. Of course there are some problem dogs but, usually it’s not the fault of the dog. It is usually a bad experience that a dog has suffered in the early stages of his/her life. It’s clear you have patience and understanding with your little Beau. Thank you again for sharing your lovely experience. We have had our second mini schnauzer Atticus one week. He has been in his crate in the kitchen from night one. In his crate we have a microwaveable toy and a scented toy that we took to breeder to get the scent of his litter on. The first night my son slept in the kitchen with him but atticus slept from 11,30 – 5 am. We haven’t looked back – he’s now 8 1/2 weeks and makes not a peep when we put him into his crate in the evening with his warmed up toy and is waking up at around 6.30 which is our normal wake up time. We did the same with our previous mini and the results were the same – I thought we were lucky but I think not !! It’s great to read about the success you have experienced with your Miniature Schnauzers. Sleepless nights are common with new puppies, but you had the wisdom to use the scented toy for both Atticus and your previous Mini Schnauzer. Wishing you many happy years ahead with Atticus.